Do we still look at and judge ourselves by virtue of a tradition or by virtue of our own private experiences? Perhaps we are too far away from the point in time where we can distinguish between having or not having a tradition? But this all depends on how we conceive of the word “we.” To be sure, millions of people around the globe are struggling with modernity and in doing so their traditions are put to the test by the ultimate modern measuring stick: experience. Traditions still matter. But what I experience, as a person, defines “me” not “us” if and only if I no longer have a tradition to measure myself against. 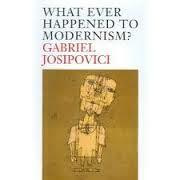 In his book What Ever Happened to Modernism? Gabriel Josipovici argues that, in the face of disenchantment (by virtue of the loss of “tradition” in the European and Christian West), the modernist writer or thinker will have to address the possibility that man may, as Protagoras once said, be the “measure of all things.” There are two options: humor or despair. It all depends on how one understands the new relationship between the author and the reader which is based on sharing an experience. Without the “traditional sacraments”(36), we must ask ourselves, as Cervantes did with Don Quixote, what the “art of narrative,” the “most mysterious of arts,” means. And this will require us to map out and discuss the death of the storyteller and the birth of the novelist. Citing Marthe Robert, Josipovici argues that the “author” of Don Quixote is “not, like the Homeric bard, a central component of an organization where each one is, by virtue of tradition, both the protégé and the protector of order, but a solitary individual, answerable to no-one but himself, without any faith other than his experience, without any guide other than his intuition”(37). The relationship of the novelist to the reader is more precarious than the relationship of the storyteller to his or her listeners. The community of the story teller is entirely different from the community of the novelist and his readers. To be sure, Don Quixote and his readers do not have a stable community and the reader cannot live their lives by the kind of “counsel” he offers. If they did, their lives would be mired in dreams, delusions, and distractions. However, that may already be the case. Even though the reader may distinguish him or herself from Quixote and even thought Quixote recognizes his folly at the end of the novel, the fact of the matter is that we readers went along with him on his journey. The adventure of experience – in the wake of tradition – does in fact provide some kind of measure and it does offer us some kind of counsel. And this is the main point. Even though we might not know “what” these literary adventures are, we still must go on them for in doing so we can find the only counsel worthy of our attention. In a world in which tradition is challenged, the new communities we form are based on the journeys that we take. But the best community of all is mired in what Jean-Luc Nancy calls the “inoperative community” which thrives on “literary communism.” What Nancy doesn’t note, however, is that this community, which is based on a kind of comic literary journey, shares the measure that defines it and that measure can only be arrived at by way of taking cognizance of what is happening…as it happens. But this taking note is always plagued by what is not noticed. And the discovery of these blindspots heightens our sense of what passes us by in each experience. This, I’d argue, is the literary event. Josipovici correctly notes that despite what the reader thinks of Don Quixote’s foolishness, he or she is complicit. For in being complicit, one can enchant a world that has been disenchanted. But this enchantment is not magical, mythical, or religious; it is secular and comical. In the modern world, we delight in the blindspots only because “we” are immersed in experience not tradition. But for those of us who are immersed in both experience and this or that religious tradition, the novel offers us a way to map out the blindspots that tradition encounters with modernity…and vice versa. And it is this journey which is even more interesting since religious experience today – in the world of social networking – has the potential of modifying religious tradition. In this situation, the novelist shares the stage with the storyteller. We have seen such a predicament in the work of Yiddish writers such as Sholem Aliechem and Mendel Mocher Sforim. But instead of Don Quixote bringing the storyteller-slash-novelist into a relationship with the reader, it is the schlemiel. And while the former is born out of the novelist, the latter is born out of a storyteller who has become a novelist. The question – whether we are talking about Aleichem or Quixote – is how far they are from the tradition. That distance or proximity will determine the kinds of shared experiences we find in this or that comic novel. But it is the fool who is the medium not the tragic-hero and that is the case because the fool is a creature of experience and tradition.